Built with Neodymium magnets and thus compatible with a wide range of metallic materials without the need for electricity. Load capacities from 150 kg / 350 lbs to 2,000 kg / 4,400 lbs. 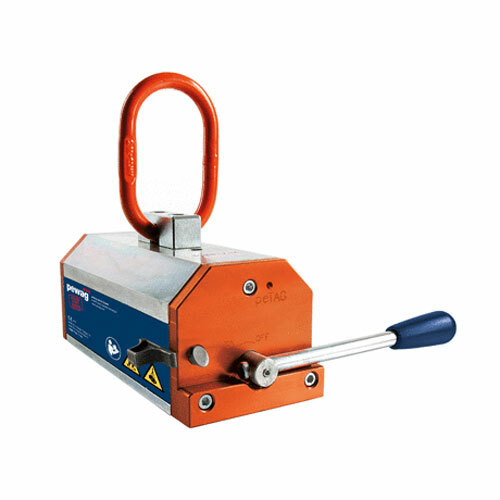 Simple and quick to mount to the lifting equipment thanks to permanently mounted master links. Suitable for flat and round material and as well for temperature ranges from -10ºC to +80ºC at 80 % maximum humidity. Maximum temperature of the load to be lifted: 60 °C. Manufactured according to EN 12100 T1 and T2, EN 13155, ASME B30.20 and Machinery Directive 2006/42/EC. * Please refer to product specification sheet for full product dimensions, and detailed information on reduction of load capacity based on material being lifted and environmental variables.